In response to my last post, "Pandora Ponders Pulling the Plug," a reader asked me whether the corporate music industry was using the new, high-priced webcasting royalty rates to deliberately kill off Internet radio. My answer was... it sure seems that way. If the Copyright Royalty Board sets royalty rates so high that only corporate controlled companies with millions of dollars in the bank can afford to pay those royalties, then smaller, independent webcasters (like Pandora) either have to shut down or risk being sued. Most will shut down. And that will mean the only webcasters out there playing music will be those the music industry WANTS to leave intact. Sounds like conspiracy-theory craziness? Yea, maybe a bit, but I'm not the only one who sees it that way. Just saw the new article at Pollstar today called "Internet Radio's Royalty Misery." "...There's also the underlying suspicion, first voiced last year when the CRB announced the new rates, that the music industry does not want to see Internet radio thrive. 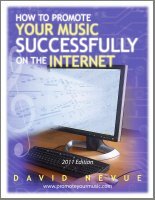 Or that it doesn't want to see as many players as the field contains, and that a smaller, more robust Internet radio industry would be more to the record labels' liking.... A 'thinning of the Internet radio herd' could result in more major-label music being streamed over the remaining Internet stations to the detriment of artists on independent labels." And then do your part to Save Internet Radio at SaveNetRadio.org. And yet Pandora, as recently as this week, announced it may soon have to shut down. Why? Because of last year's royalty hike for web radio. Remember that? You don't hear about it much in the news anymore, but it's still a very big deal. You can read more about that at SaveNetRadio.org. Please do. What it comes down to is that the very folks who claim to want to help and protect artists (SoundExchange in this case) are, by their very own actions, shutting down some of the few avenues independent artists have for getting radio play on the Internet. SoundExchange means well, I think. I mean, they send me my royalty checks and I'm grateful, very grateful. But on one hand they send me a check, on the other they threaten to take away a great source of income and exposure for me. For those of you who are interested in following all this, I really recommend you sign up for Kurt Hanson's Radio and Internet Newsletter (RAIN). You can subscribe at http://www.kurthanson.com/ . Kurt's team will give you the latest info every day on what's happening with Internet radio. It's interesting reading. As for Pandora, Tim Westergren, Pandora's founder, was just quoted as in the Washington Post as saying that Pandora is nearing a "pull-the-plug" decision as to whether to continue. The new "royalty fees" will absorb 70% of their revenue. And join with me in doing everything possible to Save Net Radio. Visit SaveNetRadio.org. Twitter is a fantastic marketing tool - a terrific way to spread your message to many people at once - in an instant. But to do that, you need to build a following, you need to "find" other people who will, in turn, find you interesting enough to follow. Jim Spencer answers that in a terrific article I ran across this morning called, "Is Twitter for the Birds?" Jim puts forward, in a very simple way, how to grow your army of Twitter followers. Read Derek Sivers announcement regarding the sale of CD Baby to Disc Makers on his blog at http://sivers.org/bye-bye-baby . I can't help but be saddened by this just a bit. It feels like the passing of an era, although Derek does indicate that he "hasn't worked at CD Baby since last year" and has "hardly been there" since 2002. Even so, he has always been the "face" of CD Baby. I very, very happy for Derek. Well-earned, my friend! It does seem inevitable to me though that CD Baby will start to look and feel a bit more "corporate." I can't help but wonder how long it will take before I and other CD Baby artists start receiving email ads from Disc Makers? Not long, I bet. Still, I can say one thing for sure. I love the new look of the CD Baby home page. That right there is an improvement. And, truth be told, if anyone was going to acquire CD Baby, Disc Makers is probably one of the best-positioned companies to do it. Here's to Derek. Cheers! Thanks for CD Baby. Looking forward to seeing what you invent next!